BAU 2019 is bigger than ever. On 200,000 square meters exhibition space the BAU presents architecture, materials and systems for commercial and residential construction, as well as for interior design of both new and existing buildings. In a new series of articles we report on the key topics coming up in the individual exhibition spaces. Part two covers the topics of Light / Smart Building, Locks / Fittings / Security, Doors / Windows, Wood and Stone / Cast stone. The new Lighting / Smart Building exhibition section will be showcased in Hall C2. In addition to artificial lighting concepts, visitors will find a range of solutions for daylight management, solar shading systems as well as arcade roof lights and roof domes. Smart building connects the individual devices using the “smart grid” and Internet of Things technology. In addition to demand-oriented—and thus efficient—energy distribution, it also facilitates seamless communication between the individual participants. 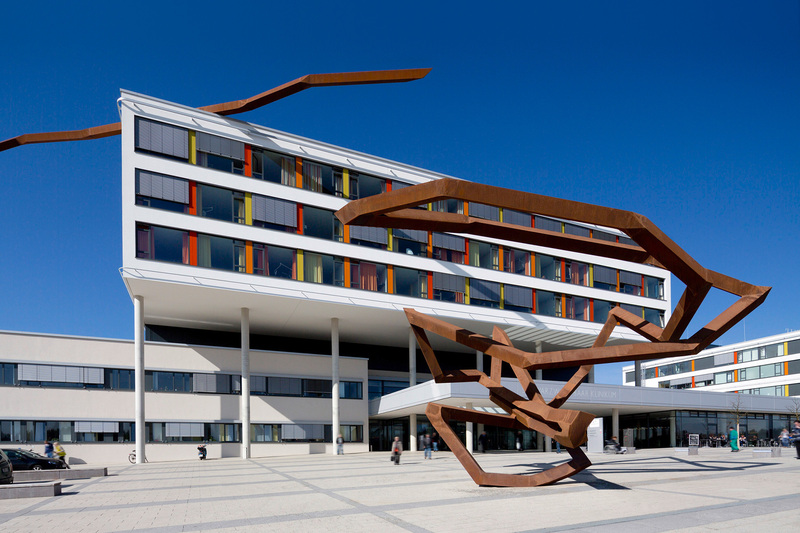 One example is the Schwarzwald-Baar-Klinikum, one of the largest non-university hospitals in Baden-Württemberg: Everything from building communication to telephony and television for patients is connected in one network. Lighting is also increasingly integrated into the smart grid. For example, blinds can be operated by smartphone, and artificial light sources can be controlled or configured and saved as lighting concepts. In terms of artificial light, LED technology has by now become the standard in lighting design. The use of artificial light sources has thus become more energy-efficient, takes up less space and requires lower maintenance. As a result, lighting concepts can now be focused on the design aspect. Digitalisation is increasingly affecting workplaces and private spaces. Smart components such as automatically operated garage doors, front doors, windows as well as roller shutter and solar shading systems improve energy efficiency, comfort and safety: We witness an increasing demand for new central locking systems, burglar alarms or status messages for open/closed windows. The required drive, sensor and control technology is growing simpler and cheaper, and radio control also allows for easy retrofitting in existing buildings. Against this background, ift Rosenheim will present the special show “Smart WinDoor TripleS—Building elements Smart Safe Secure”. The application of intelligent components, drives, sensors and safety systems will be demonstrated on the model of a living and working environment. In accordance with the Machinery Directive, specific safety requirements must be considered in the planning, tendering and design of components with electric drives. Questions on burglary resistance, fire and smoke incidents, behaviour in the event of a power failure, misuse or emergency exit procedures will also be addressed: For this purpose, normative and legal principles as well as new guidelines and testing procedures will be outlined. In addition to state-of-the-art burglary protection systems and—in particular electronic—access systems, visitors to BAU will find comprehensive information on door drive technology, fittings, locks, cylinders and accessories. Digitalisation, a key theme at the upcoming BAU, will also be crucial for the wood sector. Digital tools facilitate, among other things, the planning and construction of free forms beyond right angles—thus, for example, novel load-bearing structures can be realised. On the other hand, the desire for simplification grows in view of the increasing complexity of construction: This is why prefabrication and modular systems will find increasing application in the future. Digital tools that translate planning data directly into the 3D production of individually manufactured components will play a key role in this context. Furthermore, digital processes are essential for the visualization of structures or detailed wall, ceiling and roof installations. The manufacturer of engineered wood EGGER, for instance, will focus on intelligent digital services at the upcoming BAU: On video screens visitors can see how digital solutions are applied across all product areas. Visitors to BAU can get information about solutions for stairs, façade systems, interior fittings and timber construction. In addition, the fair will be presenting again a variety of wood materials and veneers with inspiring decors and surface structures. In this section of the exhibition, visitors will find numerous applications in the fields of façade systems and floor coverings. Natural stone in particular is a classic building material that convinces at multiple levels. The oldest building material in the world scores not only for its durability, cost-effectiveness and pollutant-free properties, but also for its aesthetic appeal: Each stone is unique and can therefore fulfil individual wishes regarding expression and design. The variety of colours, formats and possible surface finishes bestow the natural stone with its special aesthetics and value and qualify it for both interior and exterior use. New machining centres allow the cost-effective production of solid natural stone elements which, due to their compact dimensions, create special design accents. In the design of outdoor spaces and facades, local natural stones are used as a characteristic element of the cityscape. The use of local materials not only takes account of the concept of sustainability: But stone also helps to make historical significance perceptible again and to create places of identification.